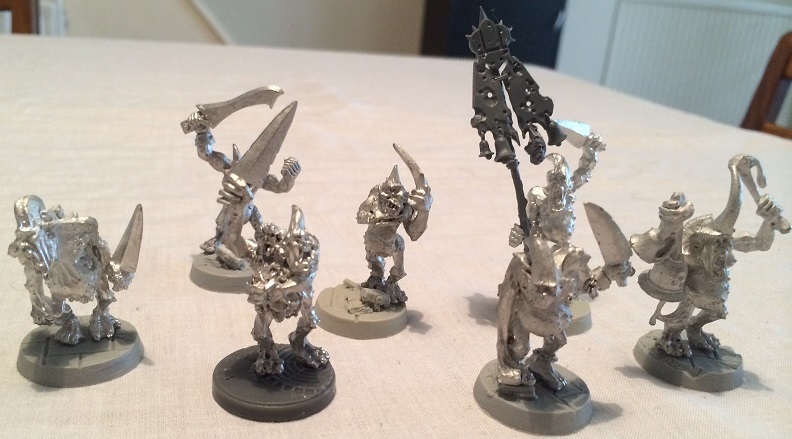 Some time ago, I picked up some of the plastic GW Plague Bearers and an Avatars of War model to use as a Herald (or Daemon Prince) of Nurgle as allies for my Chaos Marines in 40k. 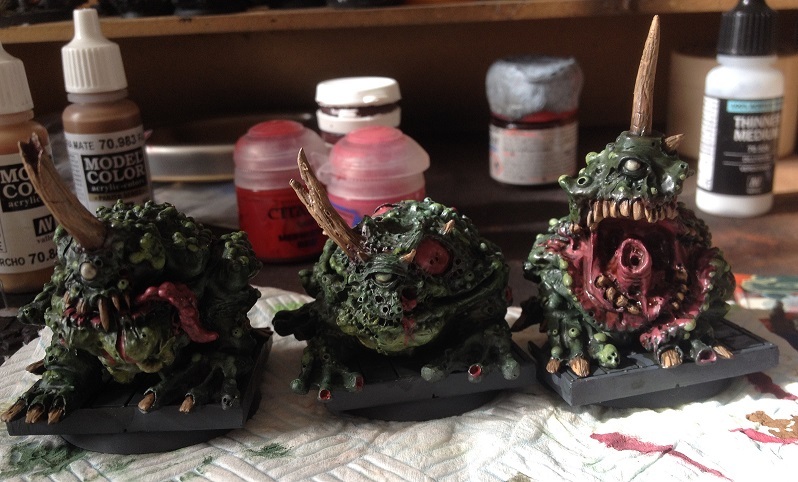 Incredibly, breaking from true Tony of Nurgle tradition, I actually painted them in a relatively short time frame. Regrettably, I only used them once or twice. So rather than leave them as a project completed in relative folly, I decided that 7th Ed 40k was a reasonably good excuse to build a new army – mono-Nurgle Daemons. If I can manage to do this on the cheap, all the better. 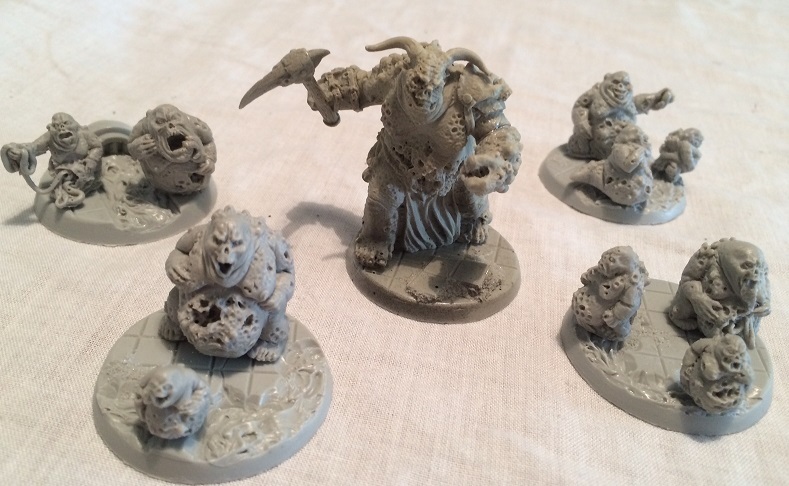 After a good look through my boxes of “miscellaneous stuff”, I unearthed some metal Plague Bearers and Great Unclean One from a Fantasy army I’d worked on a good number of years back. By my now slightly better standards of painting, they looked crap, so off they went, to meet an uncertain fate in tub full of Dettol. After 24 hours and a scrub with an old tooth brush, things were looking up, and the number of models was seemingly halfway respectable. 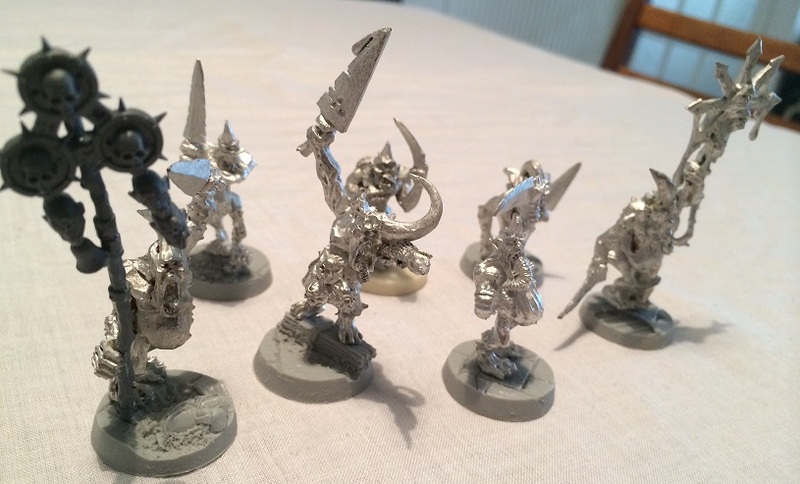 More digging around, and I uncovered some Maxmini.eu models that I bought at Salute a good few years back. These would provide me with some counts as Nurglings, and another Herald. Throw in a few bases of those spare Nurglings from the Plague Bearer sprues, and things are looking, well, more swarmy than they were before. 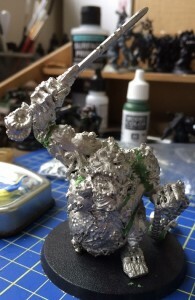 Reckon I’ll probably pick up a couple of boxes of those Nurgling stacks GW are making to further vary things up. 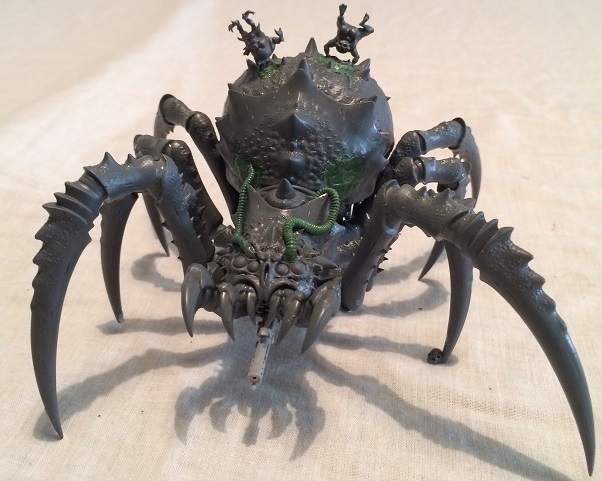 For the sake of gribble, I also converted up a GW Arachnarok (supplied for cheap by our own Gaz) into a “counts as” Soul Grinder, with the addition of some green stuff cables and tubes and a couple of capering Nurglings. Although this may well undergo further transformation. In addition, I’ll be proxying in my Plague Toads as Beasts of Nurgle. 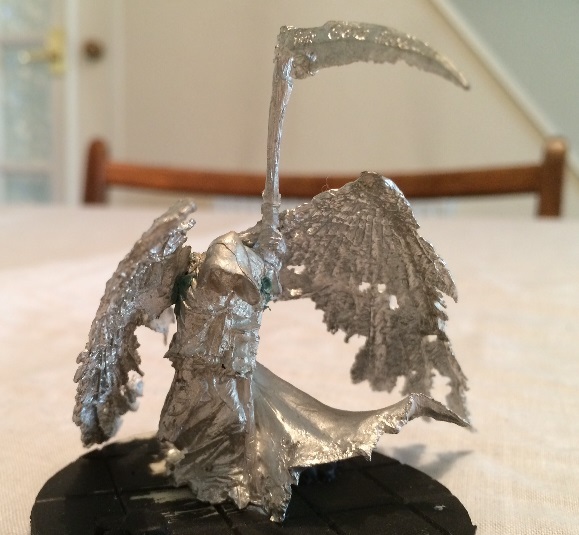 To round things out, I also found The Old Death (I think made by Enigma Miniatures), although this would have to be checked. 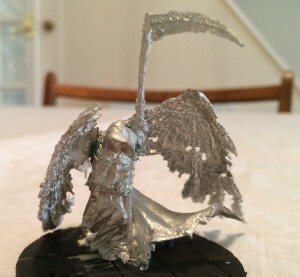 This guy should make for an imposing looking Daemon Prince, and I hope, a suitable contrast to the daemonflesh of the rest of the army. 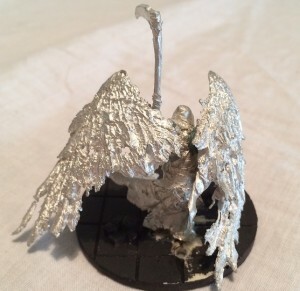 I absolutely love this model. Motarion upon reaching daemonhood? 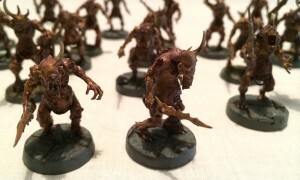 All that’s now needed is some Plague Drones. 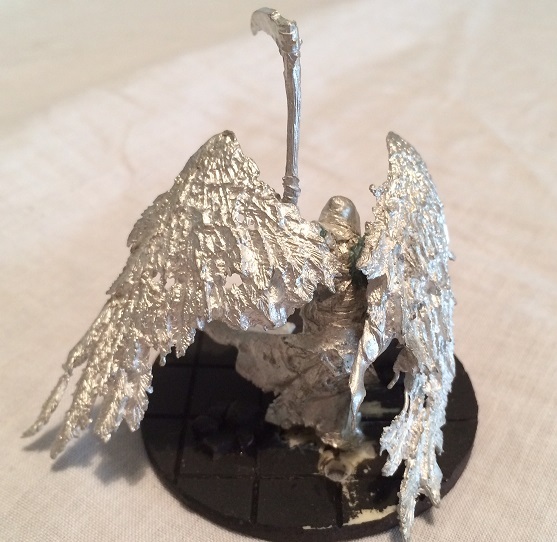 And a paint job. Not much to ask for surely? 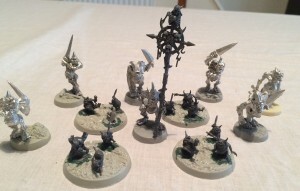 So I am oathing to get these (or at least the requisite amount of points worth) ready for the impending doubles tournament later in the year, where I will be teaming up with our very own Chris and his Iron Warriors. This entry was posted in A Tale of Gamers, Gaming, Oath Of Moment, Painting & Modelling, Warhammer 40k and tagged corehammer, nurgle, oathofmoment, wh40k by Tony of Nurgle. Bookmark the permalink. 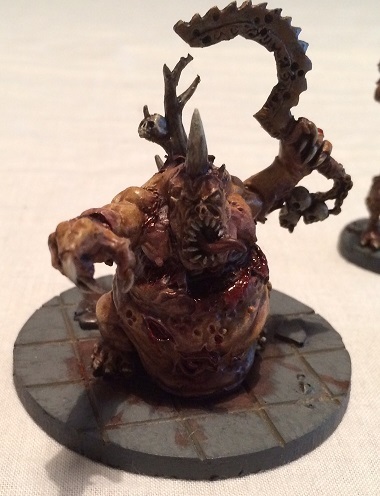 Out of all of the re-done greater daemons, that Nurgle evokes the feeling of the original sculpts the most, such a characterful, gribbily figure! 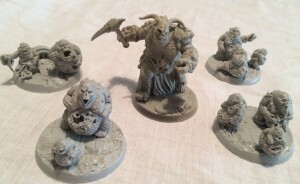 Mono-god armies are awesome, hope to see some updates on this soon! I’ve been unable to paint recently as the bit of the house my painting area is in is like a kiln. Even thinned paint on a wet palette dries on the brush! Work will continue ASAP!